Come join us for an awesome Easter experience! We have 4 services you can choose from...plus, come to our Community Easter Egg Hunt before our Saturday service! Bring the whole family out for some food, bouncy houses, games, music, and the incredible chance to make new friends at the Egg Hunt! Feel free to stay for the 4:30 service after the hunt ends. If you would like to volunteer during the event, or bring eggs for the hunt, sign up at severnrunner.info. What's the thing in your life that you love the most? Multiply that infinitely and you will begin to understand the endless love that God has for you. Throughout history we have used sin to build a wall between ourselves and God. And then came Jesus. Jesus wrecked the religious laws we created by introducing a scandalous love that destroys the walls and barriers we create. And then that love beat DEATH. Not even death could keep the love God lavishes over us away. Come hear how you can have a relationship with Him and truly understand His love for you. We have amazing Kid Time options for all kids from Birth-6th Grade. We ensure excellent care, a relevant message, and top of the line security for your kids. And did we mention that they will have a ton of fun? If you're more comfortable having your kids with you, they are welcome to join you in our main worship service as well. Learn more about: Kid's Ministry and Student Ministry. At Severn Run, we don't really care how you dress. Wear your Easter Sunday best or come in shorts and T-shirt, we just want you to be you because God uniquely created you, and you matter! Generally services last between 65-75 minutes, you can expect about the same for Easter services as well. Don't forget to allow yourself the time to check in your kids or grab a cup of coffee on your way in. You can bet on hearing some great music, a relevant message, and probably getting a laugh or two while you're at it...and you never know what stops we're going to pull out this year. Want to join an Easter serving team? Sign up below by Sunday, April 14 to live Jesus to our guests this Easter! 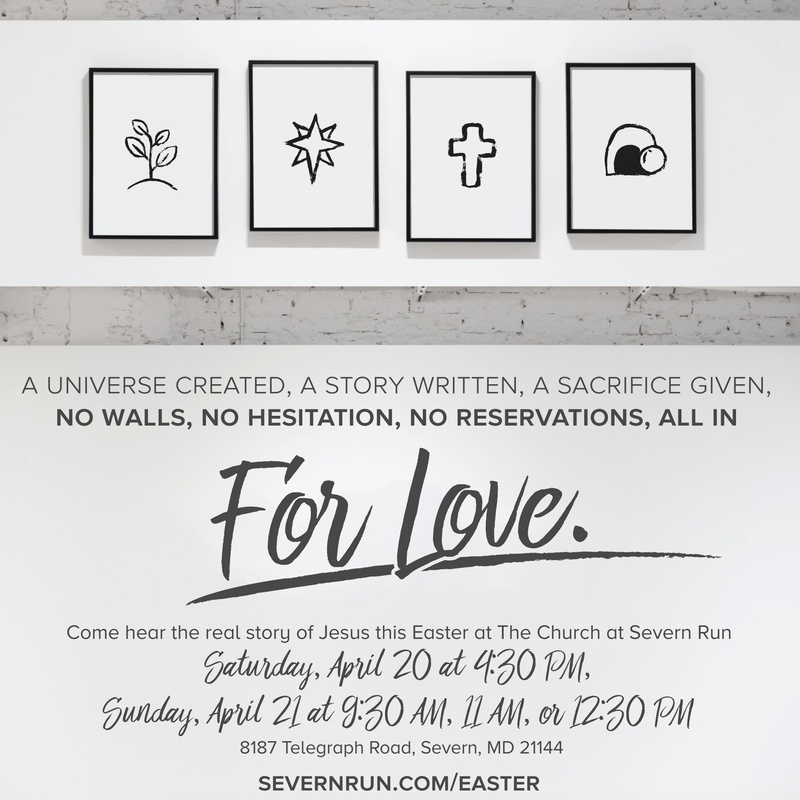 We have lots of resources available to you to invite your friends to Easter Services at Severn Run.